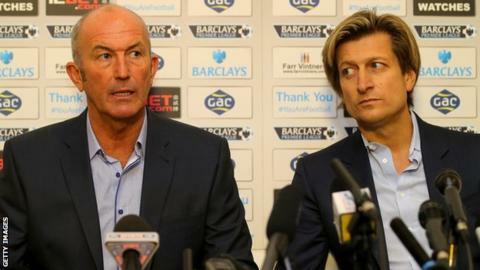 Tony Pulis is "highly unlikely" to return as Crystal Palace manager, according to co-chairman Steve Parish. Despite leaving the club eight days ago, Pulis has been installed as third-favourite for the Selhurst Park job. Palace, beaten 3-1 at home by West Ham on Saturday, have interviewed Tim Sherwood and Malky Mackay but both are now out of the running. "It's highly unlikely Tony will be coming back," Parish said. "I'd put the odds a lot longer than 3/1." Biggest win: 3-0 at Cardiff, April 2014. Biggest defeat: 3-0 at Newcastle, December 2013. Keith Millen is in temporary charge at the Premier League club but Parish is keen to make an appointment soon. "It's not a cartoon caper with people coming in and having a chat. We've seen very few people," he told Talksport. "Finding the right person isn't easy but I hope to have someone for the early part of this week." Palace have had four managers since Parish became co-chairman in 2010, with George Burley, Dougie Freedman, Ian Holloway and Pulis all having stints in charge. Parish admitted it was not ideal. "Four managers in four years is not a record I thought I would have," he said. "I have to get the right manager who will stick around a bit longer." He added: "It is really important we make a decision about who runs the place. I am not getting much sleep." Millen, speaking after the 3-1 defeat by West Ham, echoed those sentiments. "I have spoken to the chairman to see what his thoughts are," he said. "We have got the [close of the] transfer window coming up and everybody knows we need players." And even though results have not been good, Millen has not given up hope of being appointed. "I know in my personal conversations with him [Parish] what he is looking for," he said. "If he thinks I'm the right one to do it then I will talk to him again. I don't think today's result will have any real reflection on myself and my chances."